Sunday, July 19th, 2009: Sunny and Pleasant, Water Temperature 84* and Clear. John got on the water this morning at 3 and caught over 200 baits, went back to High Point to pick his clients up. Jake, Mike and Colin got in the boat and they took off, located a school of Stripers and worked them for an hour and a half, catching about 40 Stripers. They limited out with 16 Stripers and were done by 7am, a great morning of fishing! 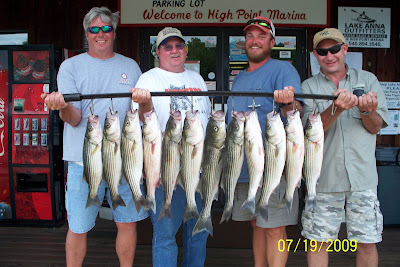 John takes them back to the marina to take pictures and get paid for the day and finds out that these gentleman expected to fish only a half day, and come to find out they booked a trip with McCotters and were suppose to meet a "John" at the marina, but not Chadduck. Chadduck realized immediately what had happened, another John from the other guide service had come by High Point and picked up Chadducks clients before Chadduck got to the marina after catching bait. How ironic it was, for the other guide had never picked up clients at High Point and probably never will again. Anyway John Chadduck found the other guide on the water and explained to the guide that he had picked up his clients [who wanted to fish a full day charter]. Chadduck informed the other guide that he had limited out and was taking them back to the marina, but the guys in the other guides boat had only caught 1 Striper that morning and wanted to get in the right boat and catch some fish. What a mess! Well, John Chadduck being the nice guy that he is took his first clients back that had limited out, went out and picked up the clients who were originally suppose to be with him and stayed out the rest of the day trying to catch fish with them. [Chadduck was suppose to work at High Point Sunday afternoon from 1 to 9 but had to find someone else to take his place due to the mishap, missing a days wage]. 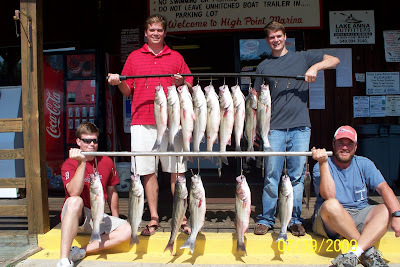 Anyway John put both sets of clients on Stripers today, both sets of clients are pictured above. Naturally John got s...... out of a days wage at the marina and had to pay the guide who messed up in the first place a half day charter price, but as John told me "I have made everyone happy today and I now have two more sets of clients that will love fishing with me, it is just going to be hard explaining to my wife why I am not getting paid for work today!"